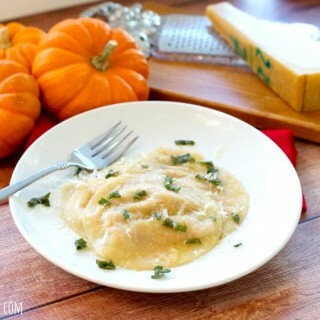 Have you ever heard of zoats? It’s a delicious filling bowl of oatmeal that is made with the help of thin shredded zucchini. Don’t worry, you won’t even notice the zucchini. It’s just there to provide fiber, vitamins and volume. No veggie flavor at all! promise. 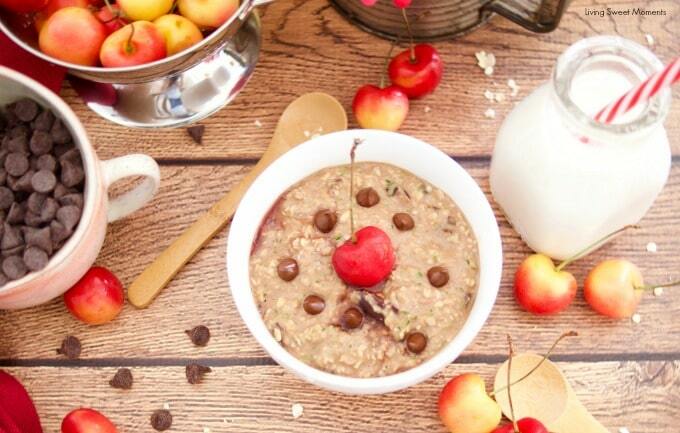 Plus there’s chocolate and cherry in there to make you forget all about the “z” part of the zoats. 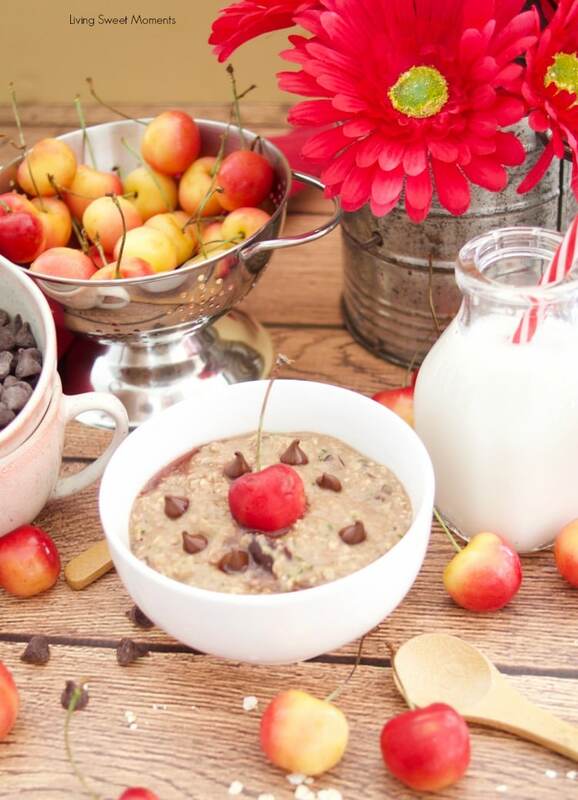 Now you can enjoy a black forest dessert for breakfast without the guilt. 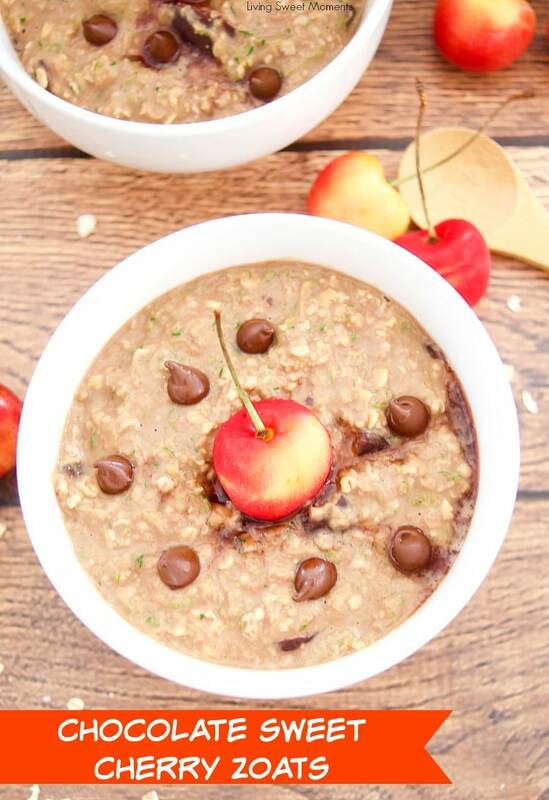 How is this Incredible Chocolate Cherry Zoats healthy? 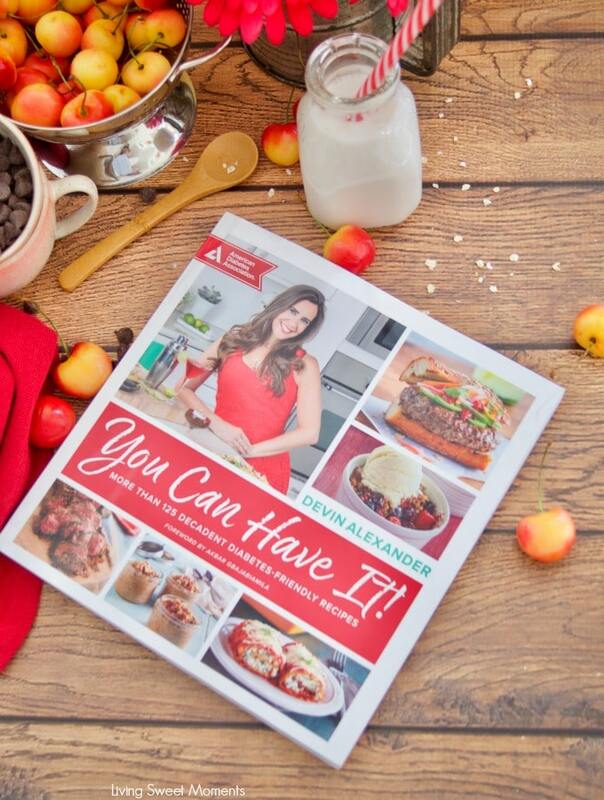 – Well I simply followed Devin Alexander‘s recipe from her new cookbook “You Can Have It”. If you’re not familiar with this Devin, she’s a cookbook author and a celebrity chef from NBC’s The Biggest Loser. I personally love her approach to eating healthy, since her recipes are decadent, abundant, colorful, and inspiring. Browsing through the pages of her cookbook you’ll soon realize that her recipes do not look like “diet food” at all. 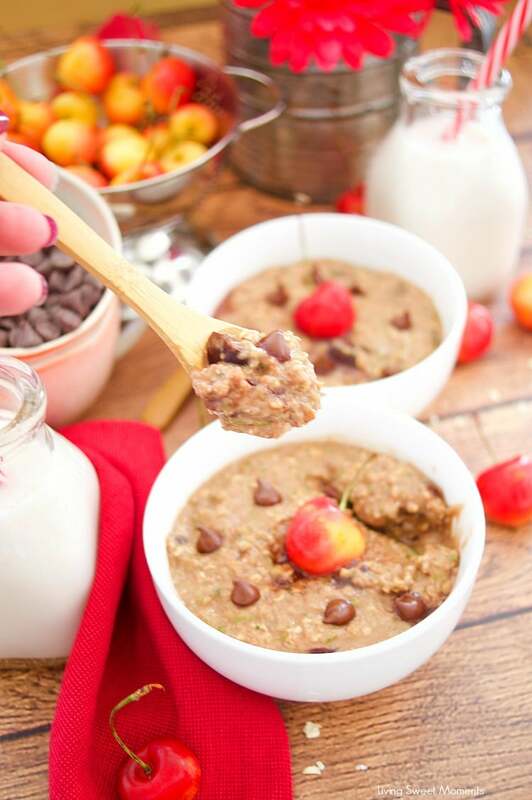 What are your favorite low-calorie, sweet treats for summer that can also be kid-friendly? I LOVE turning watermelon into “cookies” and “cupcakes” (I have a recipe for Watermelon “Cupcakes” in my new book, You Can Have It!) and am also a fan of grilling fruit and serving it with the many lean ice creams that are popping up on the market. There are also plenty of other fun (and frozen!) ways to enjoy fruits all summer long in smoothies or a tasty sorbet like this one using Truvia. 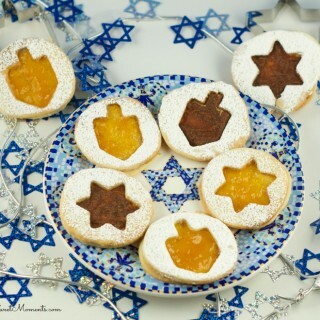 Q: What are some of your go-to products and tips when it comes to baking diabetic-friendly desserts? 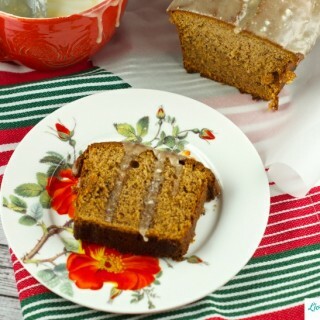  The Truvia Brown Sugar Blend and Truvia Cane Sugar Blends are my top two baking necessities! They both bake and brown like Brown Sugar and Cane Sugar, respectively, with 75% less calories than sugar. These Truvia blends are also great alternatives for anyone living with diabetes as the sweeteners have little to no effect on blood glucose or insulin!  I love cocoa powder (and, even better, cacao powder, which has even MORE antioxidants than cocoa powder. I am a huge chocoholic so I turn to cocoa or cacao powder because it has 2 grams of fiber per tablespoon, no sugar and very little fat. By smartly combining it with other ingredients, I get all of the chocolaty deliciousness with NONE of the guilt!  I love using mini filo cups as pie and tart “crusts.” They’re flaky, delicious and pre-portioned so people can “stop” after a few instead of being pure butter and empty carb like most pie crust. They’re also elegant looking so you don’t feel deprived. Q: Some of your recipes call for store-bought sauces. What is your rule of thumb when choosing the right brand? It might sound trite, but always read labels! It’s amazing how one brand of salad dressing can have sugar as the first ingredient and thus have tons of sugar, while another that’s just as tasty barely has sugar at all! Same with marinara sauce. Some are loaded with sugar and salt and some are delicious because they have Italian tomatoes and just don’t need the “garbage.” It’s admittedly sometimes a bit of a pain to find a brand you love, but it’s so worth the effort. Q: Do you have any other healthy meal prep and/or menu planning tips for busy families?  I always look forward to the summer for amazing cherries (and peaches as the summer progresses)! They transform salads in seconds when they’re so fresh and sweet! Both are great in kale and arugula salads with a touch of balsamic vinaigrette, a bit of your favorite cheese and some walnuts.  I love cooking London Broil and half, bone-in turkey breasts to eat as a dinner and then use the leftovers for deli meat and protein for my salads. Making the “deli meat” yourself will not only ensure you’re not eating deli meat that has tons of preservatives and sodium, it’s also less expensive. 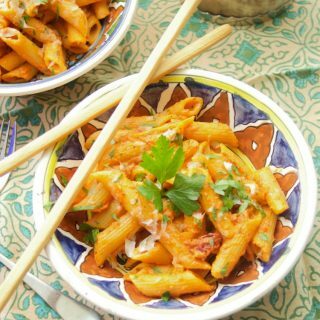 And when you use dinner leftovers, there’s obviously no extra fuss!  I know a lot of people find water “boring” so they have trouble kicking the soda habit. To assist with that, you’ll find a plethora of fruity tea bags in my pantry to make pitchers of delicious iced tea; my two current favorites are passionfruit and hibiscus sangria! Not only do these iced teas taste great without a ton of added sugar, they’re so beautiful and feel indulgent while containing zero calories. As you can see, Devin utilizes Truvia to sweeten her recipes. 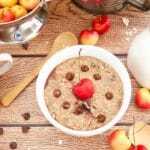 For the Chocolate Cherry Zoats, I used a packet of Truvia to give it just the right amount of “sugar” without the guilt. 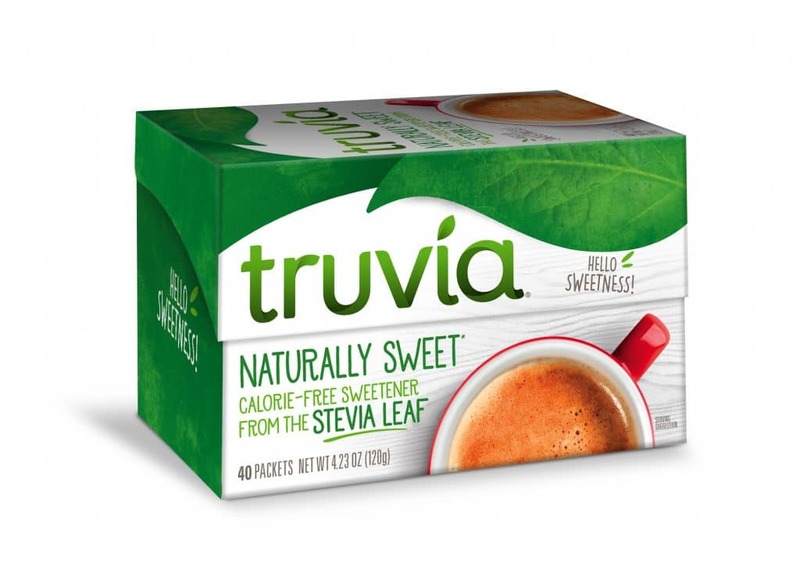 Truvia Natural Sweetener helps you reduce calories and is naturally sweetened from stevia leaf extract, the sweetest part of the stevia leaf. You can buy it in convenient packets or in a spoonable jar (perfect for baking). 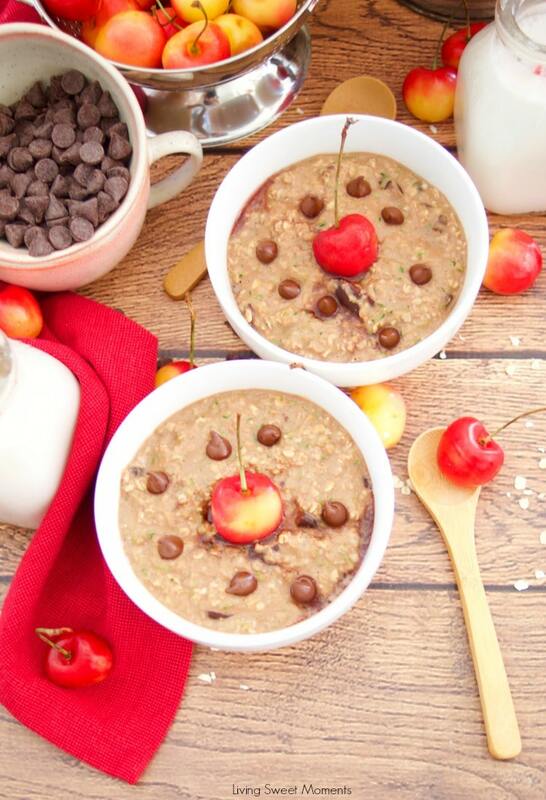 I hope you can try this delicious Chocolate Cherry Zoats at home. If you do, please upload a pic on Instagram and tag me @Livingsweetmoments or use the hashtag #LivingSweet. This recipe is extracted from Devin Alexander's Book: "You Can Have It"
This is just brilliant! I have a chocolate zucchini cake and it’s amazing how the zucchini cannot be seen or tasted. I have to try this! Wow, this is a great discovery, zucchini! who would have imagined it! This is brilliant! Never thought about it! 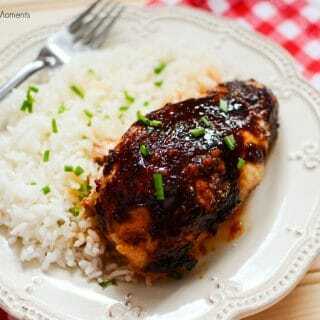 Thanks for the recipe it is amazing! Let me know what you think Dora!